Summer is here and that means we need treats that will keep us cool and refreshed! Here in Texas it can get mighty hot and ice cream is a summertime staple. The fun part comes in getting creative with it. 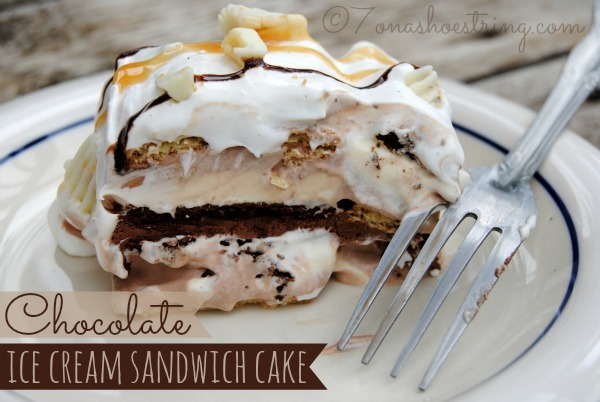 Our first creation this summer, Chocolate Ice Cream Sandwich Cake. Yum! Although the cake is simple to make, we knew it was going to be a “time sensitive” activity. My son and I worked quickly and diligently on putting it together. Ice cream sandwiches tend to melt quick so you need to have everything planned out before you begin constructing this one. Are you ready? Get set! Go! 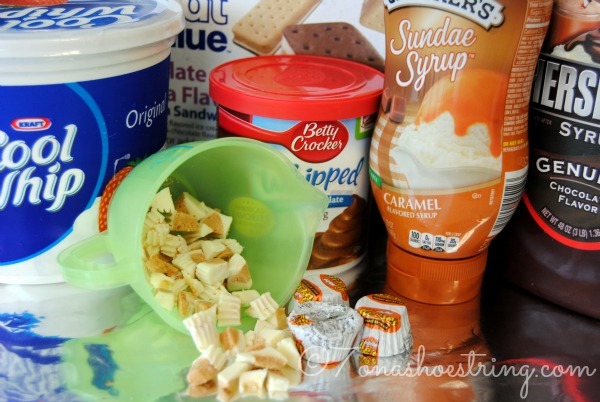 Make sure you have chopped your candy pieces, opened the syrups, and laid out the ice cream sandwiches in a pattern that works prior to unwrapping them. 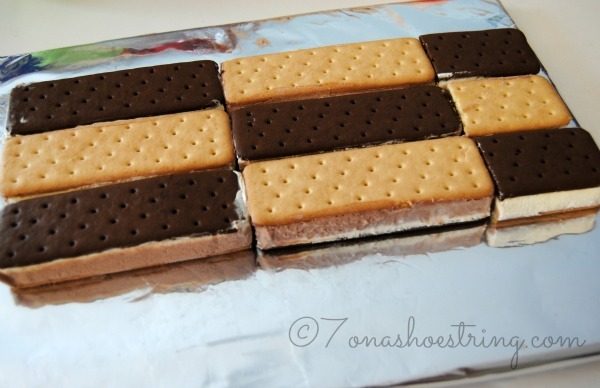 Unwrap ice cream sandwiches and lay them out in your pre-determined pattern. (Leave next layer of sandwiches in the freezer until needed). 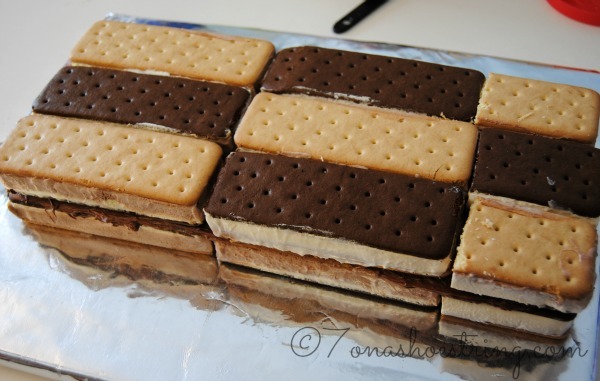 Add a layer of chocolate frosting across the top of ice cream sandwiches. 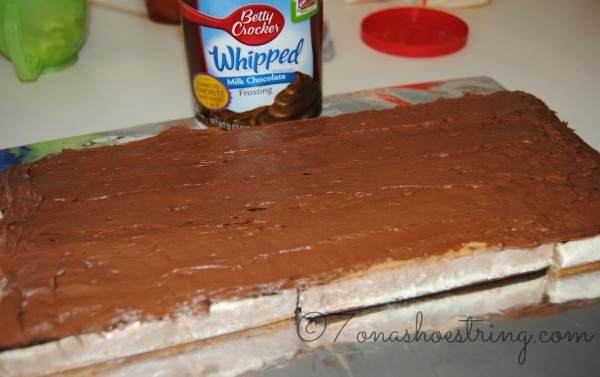 Unwrap and lay next layer of ice cream sandwiches over the chocolate frosting layer. Quickly cover entire cake with Cool Whip. 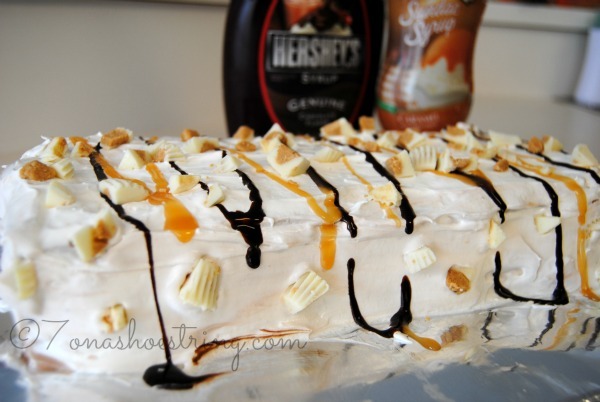 Squeeze lines of both chocolate and caramel syrups across top of cake. Sprinkle with chopped candy pieces. Whew! Wasn’t that fun?! Our biggest stress was carrying the cake in a cooler to my parent’s house about 5 minutes away. We made it as a surprise for my dad’s birthday and it was a hit! Everyone loved it. And just in time for the 90° weather we had that afternoon.